Hello everyone! I’m back after a very adventurous week last week, I left the chaos of my last term of University to go on holiday with my family. I had an absolutely amazing time on my skiing holiday and I can’t wait to share with you all some photographs from my trip. Mum, Dad, my brother and I went to Niederau, Austria, where I learnt to ski when I was younger and even though we went later than we normally would in the season, the snow was AMAZING! Plus, as it wasn’t half term the slopes were near empty, it was the perfect holiday – although, we did get caught in a blizzard and that was a little terrifying! We also went tobogganing which was so much fun, I did accidentally hit a wall but don’t worry, I’m okay! I wish I could be back there right now instead of swamped with coursework but I’m nearly at the end of my University degree which is another adventure all in itself! As our flight was in the evening on the way back too, we also spent the morning in Innsbruck which was lovely, we saw the Goldenes Dachl (Golden Roof) and had the best ice cream ever. Ice cream in the snow, I know! Hope you enjoy this little post with an insight into my skiing holiday – Don’t worry, I won’t share the several hundreds of photographs that I actually took on the trip! Have you ever been skiing, if so where did you go? Hope you enjoy the post! Don’t forget to follow me along on my Instagram and Twitter, you can keep up with what I’m doing when I’m not blogging. All photographs included in this blog post are my own. Next ArticleMini Egg Rocky Road – Easter Special! Always great to see your pics! Looks fabulous. I have never been skiing although I spent some of my honeymoon in an Austrian town called Igles. We went up the mountain in the cable car & I nearly didn’t come back down again!!! Yep I’m a wuss but it terrifies me! Not you though you look right at home. I’ve never been skiing before but it sure does look beautiful! I bet the blizzard was a bit scary too. It looks like you had such a fun time! I have been cross country skiing when I was younger but have never done downhill. Maybe someday I’ll get the chance! I wish I had learned to ski when I was younger. It looks like you had an amazing time.Thanks for sharing and reminding me it’s never to late to learn something new. That looks like quite a fun trip. I’ve never been skiing, and I’m not sure my knees or ankles could handle it, but it’s something I have kind of wanted to do. Looks like you had a blast! I’ve never been skiing (I’m Canadian, so it’s shameful haha) but I really want to try it out. Hey everyone! 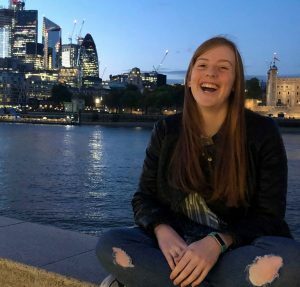 I'm Imogen, I'm a 22 year old English student currently studying in London. I'm also an artist, athlete, photographer and writer, I started this blog as I love to write and share my thoughts and I'm loving the journey so far! 2019 Copyright Imogen Chloe. Blossom Chic by Blossom Themes. Powered by WordPress .